Ever see a car move sideways before? CARS THAT CAN move in different directions might not be a new idea but we’re still a long way from seeing such a feature included in our cars. Yet that hasn’t stopped some from creating their own versions. The latest attempt comes from inventor William Liddiard whose prototype wheels allow a car move in any direction. The wheels can be bolted on, meaning no modifications need to be made to the car, and Liddiard claims they’re designed to be used “in all weather and road conditions… [and] can take a beating”. 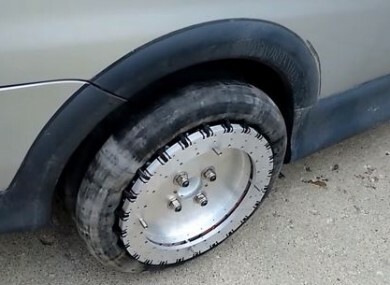 They have the same characteristics as regular tyres but can drive in any direction, and while the video shows the movement to be slow, he says that faster speeds are possible. The car uses 24,000 pounds of torque directly on the tyres, something Liddiard says wasn’t necessary as he could use a lower gearing ratio. According to Inverse, Liddiard said he has been working on this prototype for three years and if it’s made commercial, he would like to see it being used in numerous markets like autonomous cars, mobile robotics and personal mobility. For now, he is looking for companies who might licence or partner with him so he can bring the technology to market. Email “These prototype wheels would make parallel parking an easier task”. Feedback on “These prototype wheels would make parallel parking an easier task”.